Cell phones are a fantastic convenience, but they come with unexpected surprises like unwanted phone calls. Maybe your cell phone number was recycled and belonged to someone else. Or, your number mistakenly appeared in some directory for a business. Regardless of the cause, solutions are popping up ranging from downloadable apps and 3rd party services that can help manage the experience. Some of the solutions mentioned below rely on the phone reading the Caller ID information. This info is often needed as it is what you use to filter callers in some cases. You might think of this in the same way you block spam. You can not block the email without knowing the sender’s email address. People can generally block their Caller ID information using one of the methods below. And while this does provide benefits, it may mean that some people may not get your phone calls if they block any unknown caller. Like residential service, there are two ways you can block your cell number from being sent to another party. The first solution is to request aline blockfrom your cell carrier. This feature is offered by most carriers, sometimes for a monthly fee. If you need to display your phone number for a specific call, you dial *82and then the phone number. The second way to block your phone number from displaying is on an individual call basis. This may be best when you’re asking about a product or service and you don’t want to provide your number. To block your phone number from being sent, press *67and then the phone number you wish to call. One way I remember this is *OS for Off Screen. Your number can’t be blocked in all situations. For example, your cell number will be sent if you dial most emergency services. Also, if you’re dialing toll-free prefixes such as 700, 800 and 900 your number is also sent. These systems rely on a technology calledANI. This solution is designed to cut down on unsolicited calls from telemarketers. One option US residents have is to register your personal cell phone number in the National Do Not Call Registry. Your registration is valid for five years and should take effect 31 days after you register. To verify your number is in the Do Not Call Registry, dial 1-888-382-1222. This is one area that has improved over the years. Some cell phone companies have implemented account management features. These allow you to block certain services or phone numbers even down to an individual number. If you haven’t checked in a while, it might be worth calling tech support or using their community forum. For example, Verizon Wireless has a service that allows you to block calls..
It’s important to note that just because you know the number of the caller, that doesn’t mean your cell phone or carrier does. For example, let’s say you wanted to block your ex-boss. Although you know their number, they may block their information so it isn’t passed to your cell carrier. The cell carrier sees them like every other caller who has also blocked Caller ID. In some cases, these services will allow you to block all people like this. The downside to this “all or none” strategy is that some of your friends may have to unblock their number to call you. Sometimes the carriers will put restrictions on this feature. For example, they may limit the number of blocks. Additionally, some providers don’t offer this feature for prepaid calling plans. Another area where mobile carriers may offer help is with harassment. Most states have laws defining what is phone harassment or cyber stalking. Your service provider may prefer you file a police report before contacting them. Some may only proceed if a subpoena is issued. As example, ATT has an Annoyance Call Bureau. Your phone may provide some built in options such as filtering based on the Caller ID. 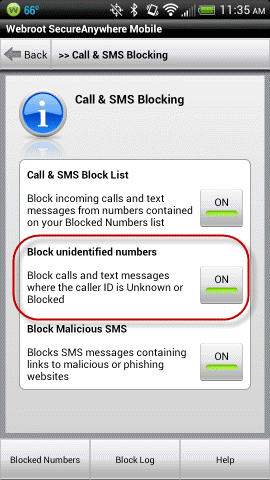 For example, phones that use the Android operating system allow you to block callers provided they don’t have Caller ID blocked. You can pull up a contact’s record and you should see an option for Block Caller. This panel may differ based on which version of Android your phone uses. Apple has taken a different approach in iOS 6 for their iPhones. 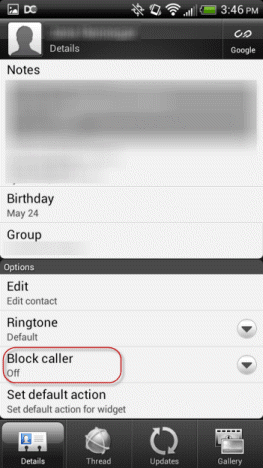 Instead of you blocking specific contacts, it allows you to control which ones get through. 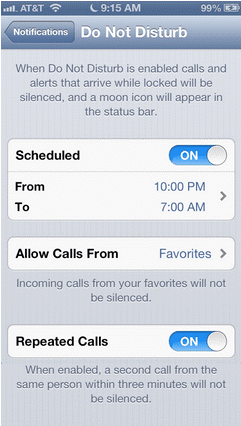 The feature is called Do Not Disturb and limits more than phone calls. This works well for people that like to control who has access to their cell number, but probably wouldn’t work in sales or support roles. I can see people using it for times when they need to focus on work or studies. If your cell carrier or phone’s operating system don’t allow you to block callers, you can probably find a downloadable app. Ideally, this is a program that doesn’t require you to “jailbreak” your phone. Jailbreaking your phone may cause problems with the manufacturer and impact your warranty so you should consider that option carefully. You may not be able to stop the call, but you may be able to silence the ring. This requires that your phone allow you to assign ring tones to contacts. A good example is a forum tip I saw where the owner assigned a silent MP3 file as the default ring tone. For known contacts, the author assigned an audible ring tone. The result was the phone could only be heard when a known contact called. Your phone may have a built in silent ring tone. Before downloading an app, I would carefully read what other users have posted as sometimes these comments show which phones and carriers people are using. I’d also suggest using a mobile security program to make sure the program isn’t creating new security or privacy problems. While early versions of these services dealt with viruses, many of them now include some sort of call management feature. 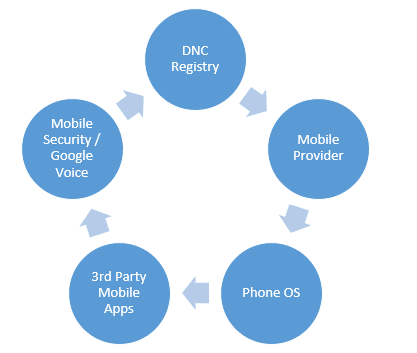 One example, which is free, is Webroot’s Secure Anywhere Mobile for Android. The company also offers a premium version with more features. In the screen snap below you can see where I can block both unknown callers such as those people who block Caller ID or individual numbers. Manage Your Calls With Google Voice. This last option should work if your phone or carrier is restrictive. Google Voice is a convenient option if you get a new cell phone number as you can give out your Google Voice number instead. I like to think of the service as a pre-call processor. Basically, the free service allows you to create different groups of callers with different rules. For example, you could have a group for “friends and family” and have these people ring through to your cell phone and home phone. In contrast, you might have a group called “vendors” that can only reach you at set times and hear a different greeting. In addition, you can have people you don’t know go straight to voicemail.